Eye care is self-care. And as you get older you tend to lose the ability to focus (it’s totally normal!) and some of us (hello, me) have needed glasses since high school-- or earlier. Simple with a touch of flair, this Prada frame is uncompromisingly crafted. As well as understated and elegant. With a slight cat eye that’s right on trend and corner white enamel detail, this is a go-to for summer. We’re gonna Coach you for a sec on fashion frames. The detailing on this Coach frame is spec-tacular. We’re loving the gold and tortoise combo, but it’s the silver floral work that truly deserves your attention. (And will likely garner the attention of others.) These babies are made for out of office days. Ray-Ban has dominated the sunny shades category for years now. It’s likely you have a pair of Aviators somewhere in a top drawer. But have you checked out their optical line? 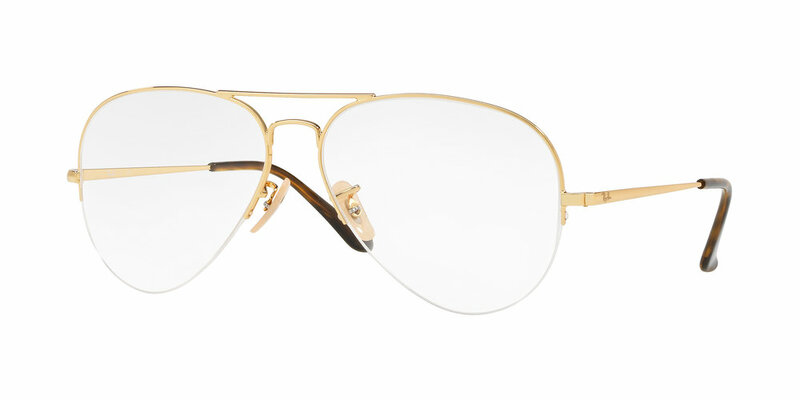 Classic good looks... that’s what these gold Aviators are. If pink is your favorite color, this pair of blush eyeglasses from Michael Kors can be your new go-to. Pink isn’t going anywhere-- nor should it. And with these frames, all trends will be crystal clear. With a gold tone logo at temples, this classic pair of Tory Burch tortoise eyeglasses will forever be in style. And you’ll be able to see your emails! That’s what we call a win-win. But it’s not just about fashion. It’s also about eye health. The bonus happens to be: Eyewear is one of the most flattering and fashionable accessories you can own. A great frame can complete your entire outfit and they are super fun to shop for. But don’t forget to get your eyes checked. You can’t get a cute pair of glasses without first getting an eye exam. It’s not only crucial to maintaining vision heath, but your overall wellbeing. LensCrafters latest eye exam Clarifye, digitally scans your entire eye to pinpoint your prescription and give your doctor a new level of precise detail. In just 60 seconds, your eye doctor will know more about your eyes than a traditional eye exam ever could. Should You Switch to Cold Brew?